Anyone who is aware of my interest in movies (especially older films) knows how much I enjoy Alfred Hitchcock directed films. For my money, there are very few directors as good as Hitchcock. I could go on and on about how perfectly done his films are, and how no one else mastered building suspense and tension better than Hitch. But that should be obvious to anyone who’s seen his films. And although I’ve seen the vast majority of his films, some multiple times, this past weekend I got to experience one of his films, Vertigo, in a way that was new for me–on the big silver screen of a movie theater. It was a completely unique way to view the film, and one that made me appreciate it even more. Some of Hitch’s movies are in small settings, like Rope and Lifeboat, and although great films, do not make frequent use of brilliant and stunning, almost larger than life visuals. But others like North by Northwest work on a different level, with visuals you are not soon to forget, all them beautifully shot. 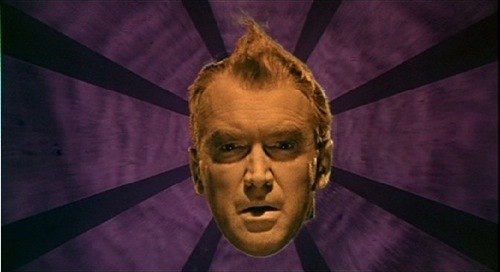 Vertigo is one of those latter films, and seeing it on the big screen really exemplified that. Almost every shot of the film is perfect and just looked even better in this way. From the vastness of the Golden Gate Bridge, to Stewart’s odd dream sequence, his various bouts with Vertigo and everything in between, it really became obvious that this just might be Hitch’s best film. It is certainly, as I learned this weekend, the greatest of all his films visually. From the opening credits to the final shot, everything could not any better. Perhaps it could be said that every film would look better on the big screen, but in this setting Vertigo excelled.